This Fermilab press release came out on April 13, 2015. Scientists on the Dark Energy Survey have released the first in a series of dark matter maps of the cosmos. These maps, created with one of the world’s most powerful digital cameras, are the largest contiguous maps created at this level of detail and will improve our understanding of dark matter’s role in the formation of galaxies. Analysis of the clumpiness of the dark matter in the maps will also allow scientists to probe the nature of the mysterious dark energy, believed to be causing the expansion of the universe to speed up. The new maps were released today at the April meeting of the American Physical Society in Baltimore, Maryland. They were created using data captured by the Dark Energy Camera, a 570-megapixel imaging device that is the primary instrument for the Dark Energy Survey (DES). Dark matter, the mysterious substance that makes up roughly a quarter of the universe, is invisible to even the most sensitive astronomical instruments because it does not emit or block light. But its effects can be seen by studying a phenomenon called gravitational lensing – the distortion that occurs when the gravitational pull of dark matter bends light around distant galaxies. Understanding the role of dark matter is part of the research program to quantify the role of dark energy, which is the ultimate goal of the survey. This analysis was led by Vinu Vikram of Argonne National Laboratory (then at the University of Pennsylvania) and Chihway Chang of ETH Zurich. Vikram, Chang and their collaborators at Penn, ETH Zurich, the University of Portsmouth, the University of Manchester and other DES institutions worked for more than a year to carefully validate the lensing maps. The camera was constructed and tested at the U.S. Department of Energy’s Fermi National Accelerator Laboratory and is now mounted on the 4-meter Victor M. Blanco telescope at the National Optical Astronomy Observatory’s Cerro Tololo Inter-American Observatory in Chile. The data were processed at the National Center for Supercomputing Applications at the University of Illinois in Urbana-Champaign. The dark matter map released today makes use of early DES observations and covers only about three percent of the area of sky DES will document over its five-year mission. The survey has just completed its second year. As scientists expand their search, they will be able to better test current cosmological theories by comparing the amounts of dark and visible matter. Those theories suggest that, since there is much more dark matter in the universe than visible matter, galaxies will form where large concentrations of dark matter (and hence stronger gravity) are present. So far, the DES analysis backs this up: The maps show large filaments of matter along which visible galaxies and galaxy clusters lie and cosmic voids where very few galaxies reside. Follow-up studies of some of the enormous filaments and voids, and the enormous volume of data, collected throughout the survey will reveal more about this interplay of mass and light. 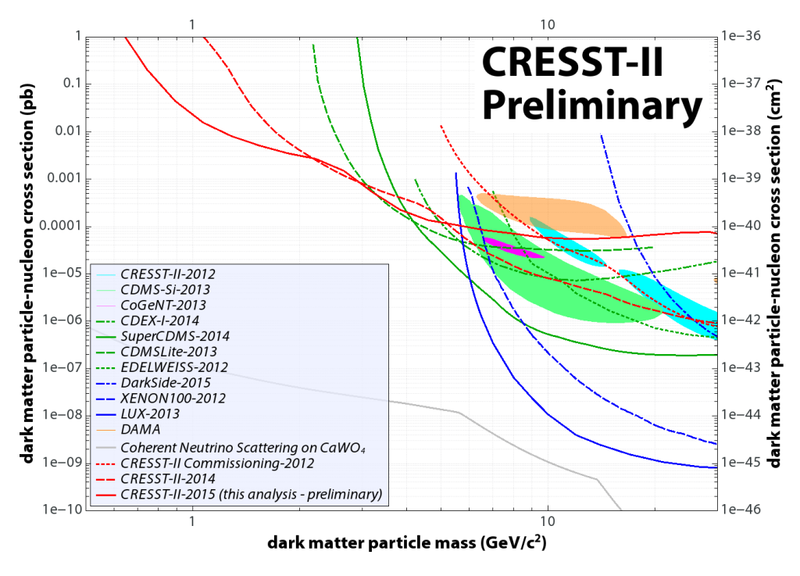 View the Dark Energy Survey analysis. The Dark Energy Survey is a collaboration of more than 300 scientists from 25 institutions in six countries. 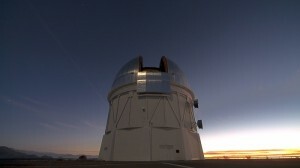 Its primary instrument, the Dark Energy Camera, is mounted on the 4-meter Blanco telescope at the National Optical Astronomy Observatory’s Cerro Tololo Inter-American Observatory in Chile, and its data is processed at the National Center for Supercomputing Applications at the University of Illinois at Urbana-Champaign. Funding for the DES Projects has been provided by the U.S. Department of Energy Office of Science, the U.S. National Science Foundation, the Ministry of Science and Education of Spain, the Science and Technology Facilities Council of the United Kingdom, the Higher Education Funding Council for England, ETH Zurich for Switzerland, the National Center for Supercomputing Applications at the University of Illinois at Urbana-Champaign, the Kavli Institute of Cosmological Physics at the University of Chicago, Financiadora de Estudos e Projetos, Fundação Carlos Chagas Filho de Amparo à Pesquisa do Estado do Rio de Janeiro, Conselho Nacional de Desenvolvimento Científico e Tecnológico and the Ministério da Ciência e Tecnologia, the Deutsche Forschungsgemeinschaft and the collaborating institutions in the Dark Energy Survey. The DES participants from Spanish institutions are partially supported by MINECO under grants AYA2012-39559, ESP2013-48274, FPA2013-47986 and Centro de Excelencia Severo Ochoa SEV-2012-0234, some of which include ERDF funds from the European Union. Fermilab is America’s premier national laboratory for particle physics and accelerator research. A U.S. Department of Energy Office of Science laboratory, Fermilab is located near Chicago, Illinois, and operated under contract by the Fermi Research Alliance, LLC. Visit Fermilab’s website at www.fnal.gov and follow us on Twitter at @Fermilab. This Fermilab press release came out on March 10, 2015. Scientists on two continents have independently discovered a set of celestial objects that seem to belong to the rare category of dwarf satellite galaxies orbiting our home galaxy, the Milky Way. Dwarf galaxies are the smallest known galaxies, and they could hold the key to understanding dark matter and the process by which larger galaxies form. A team of researchers with the Dark Energy Survey, headquartered at the U.S. Department of Energy’s Fermi National Accelerator Laboratory, and an independent group from the University of Cambridge jointly announced their findings today. Both teams used data taken during the first year of the Dark Energy Survey, all of which is publicly available, to carry out their analysis. “The large dark matter content of Milky Way satellite galaxies makes this a significant result for both astronomy and physics,” said Alex Drlica-Wagner of Fermilab, one of the leaders of the Dark Energy Survey analysis. These newly discovered objects are a billion times dimmer than the Milky Way and a million times less massive. The closest of them is about 100,000 light-years away. Scientists have previously found more than two dozen of these satellite galaxies around our Milky Way. About half of them were discovered in 2005 and 2006 by the Sloan Digital Sky Survey, the precursor to the Dark Energy Survey. After that initial explosion of discoveries, the rate fell to a trickle and dropped off entirely over the past five years. 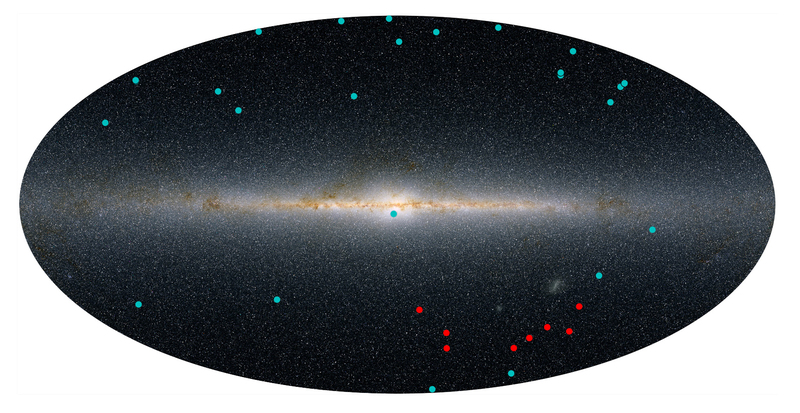 The Dark Energy Survey is looking at a new portion of the southern hemisphere, covering a different area of sky than the Sloan Digital Sky Survey. The galaxies announced today were discovered in a search of only the first of the planned five years of Dark Energy Survey data, covering roughly one-third of the portion of sky that DES will study. Scientists expect that the full Dark Energy Survey will find up to 30 of these satellite galaxies within its area of study. This illustration maps out the previously discovered dwarf satellite galaxies (in blue) and the newly discovered candidates (in red) as they sit outside the Milky Way. Image: Yao-Yuan Mao, Ralf Kaehler, Risa Wechsler (KIPAC/SLAC). Atlas image obtained as part of the Two Micron All Sky Survey (2MASS), a joint project of the University of Massachusetts and the Infrared Processing and Analysis Center/California Institute of Technology, funded by the National Aeronautics and Space Administration and the National Science Foundation. 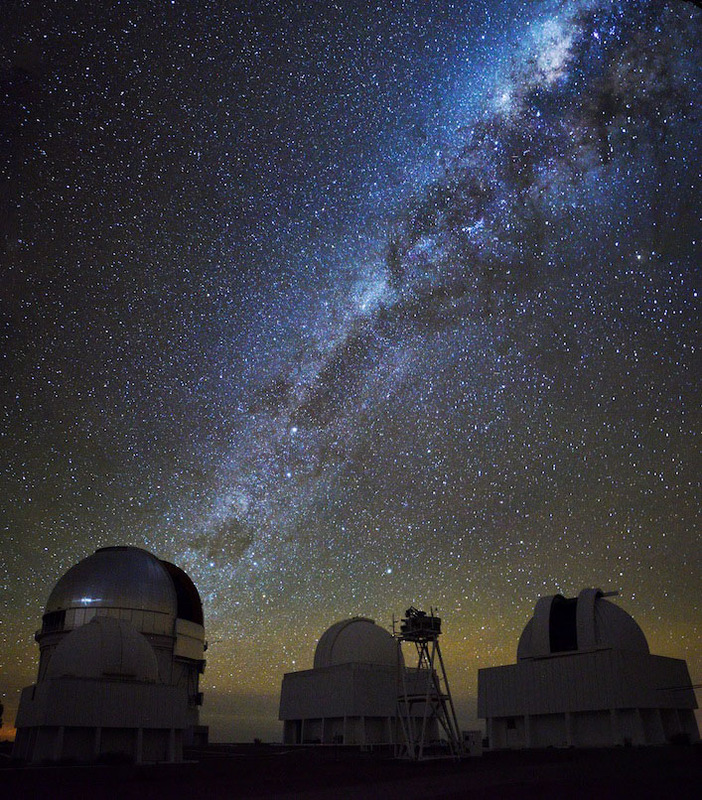 While more analysis is required to confirm any of the observed celestial objects as satellite galaxies, researchers note their size, low surface brightness and significant distance from the center of the Milky Way as evidence that they are excellent candidates. Further tests are ongoing, and data collected during the second year of the Dark Energy Survey could yield more of these potential dwarf galaxies to study. 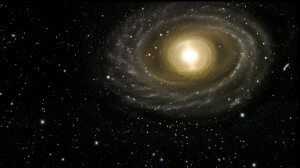 Newly discovered galaxies would also present scientists with more opportunities to search for signatures of dark matter. Dwarf satellite galaxies are dark matter-dominated, meaning they have much more mass in unseen matter than in stars. The nature of this dark matter remains unknown but might consist of particles that annihilate each other and release gamma rays. Because dwarf galaxies do not host other gamma ray sources, they make ideal laboratories to search for signs of dark matter annihilation. Scientists are confident that further study of these objects will lead to even more sensitive searches for dark matter. In a separate result also announced today, the Large Area Telescope Collaboration for NASA’s Fermi Gamma-Ray Telescope mission reported that they did not see any significant excess of gamma ray emission associated with the new Dark Energy Survey objects. This result demonstrates that new discoveries from optical telescopes can be quickly translated into tests of fundamental physics. The Dark Energy Survey is a five-year effort to photograph a large portion of the southern sky in unprecedented detail. Its primary instrument is the Dark Energy Camera, which – at 570 megapixels – is the most powerful digital camera in the world, able to see galaxies up to 8 billion light-years from Earth. Built and tested at Fermilab, the camera is now mounted on the 4-meter Victor M. Blanco telescope at the Cerro Tololo Inter-American Observatory in the Andes Mountains in Chile. The survey’s five-year mission is to discover clues about the nature of dark energy, the mysterious force that makes up about 70 percent of all matter and energy in the universe. Scientists believe that dark energy may be the key to understanding why the expansion of the universe is accelerating. The Dark Energy Survey analysis is available here. The University of Cambridge analysis is available here. The Dark Energy Survey is a collaboration of more than 300 scientists from 25 institutions in six countries. For more information about the survey, please visit the experiment’s website. Funding for the DES Projects has been provided by the U.S. Department of Energy, the U.S. National Science Foundation, the Ministry of Science and Education of Spain, the Science and Technology Facilities Council of the United Kingdom, the Higher Education Funding Council for England, the National Center for Supercomputing Applications at the University of Illinois at Urbana-Champaign, the Kavli Institute of Cosmological Physics at the University of Chicago, Financiadora de Estudos e Projetos, Fundação Carlos Chagas Filho de Amparo à Pesquisa do Estado do Rio de Janeiro, Conselho Nacional de Desenvolvimento Científico e Tecnológico and the Ministério da Ciência e Tecnologia, the Deutsche Forschungsgemeinschaft and the collaborating institutions in the Dark Energy Survey. The DES participants from Spanish institutions are partially supported by MINECO under grants AYA2012-39559, ESP2013-48274, FPA2013-47986 and Centro de Excelencia Severo Ochoa SEV-2012-0234, some of which include ERDF funds from the European Union. The DOE Office of Science is the single largest supporter of basic research in the physical sciences in the United States and is working to address some of the most pressing challenges of our time. For more information, please visit science.energy.gov . The mission of the University of Cambridge is to contribute to society through the pursuit of education, learning and research at the highest international levels of excellence. To date, 90 affiliates of the university have won the Nobel Prize. Founded in 1209, the university comprises 31 autonomous colleges, which admit undergraduates and provide small-group tuition, and 150 departments, faculties and institutions. Cambridge is a global university. Its 19,000 student body includes 3,700 international students from 120 countries. Cambridge researchers collaborate with colleagues worldwide, and the university has established larger-scale partnerships in Asia, Africa and America. The university sits at the heart of one of the world’s largest technology clusters. The ‘Cambridge Phenomenon’ has created 1,500 hi-tech companies, 14 of them valued at over US$1 billion and two at over US$10 billion. Cambridge promotes the interface between academia and business and has a global reputation for innovation. www.cam.ac.uk . This article appeared in symmetry on Jan. 22, 2015. The Dark Energy Camera, or DECam, peers deep into space from its mount on the 4-meter Victor Blanco Telescope high in the Chilean Andes. Thirty percent of the camera’s observing time—about 105 nights per year—go to the team that built it: scientists working on the Dark Energy Survey. Another small percentage of the year is spent on maintenance and upgrades to the telescope. So who else gets to use DECam? Dozens of other projects share its remaining time. Many of them study objects far across the cosmos, but five of them investigate ones closer to home. Overall, these five groups take up just 20 percent of the available time, but they’ve already taught us some interesting things about our planetary neighborhood and promise to tell us more in the future. 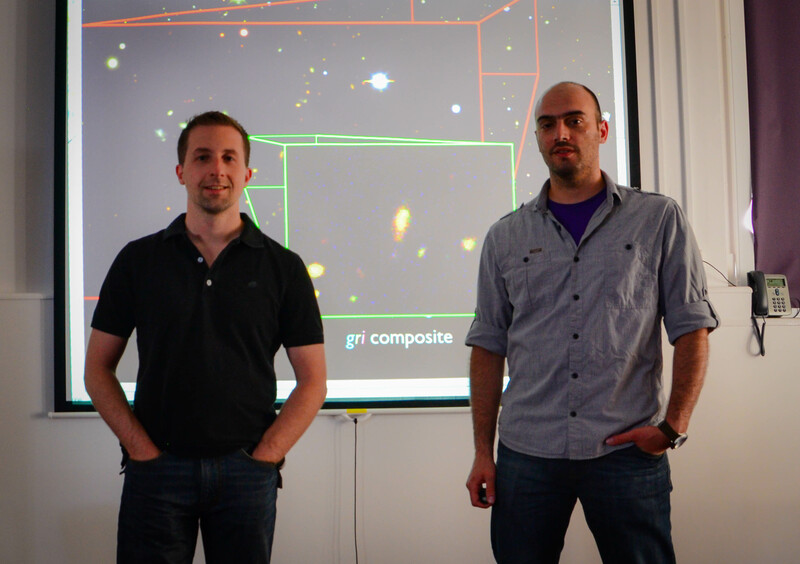 Stony Brook University’s Aren Heinze and the University of Western Ontario’s Stanimir Metchev used DECam for four nights in early 2014 to search for unknown members of our solar system’s main asteroid belt, which sits between Mars and Jupiter. To detect such faint objects, one needs to take a long exposure. However, the paths of these asteroids lie close enough to Earth that taking an exposure longer than a few minutes results in blurred images. Heinze and Metchev’s fix was to stack more than 100 images taken in less than two minutes each. With this method, the team expects to measure the positions, motions and brightnesses of hundreds of main belt asteroids not seen before. They plan to release their survey results in late 2015, and an early partial analysis indicates they’ve already found hundreds of asteroids in a region smaller than DECam’s field of view—about 20 times the area of the full moon. Scott Sheppard of the Carnegie Institution for Science in Washington DC and Chad Trujillo of Gemini Observatory in Hilo, Hawaii, use DECam to look for distant denizens of our solar system. 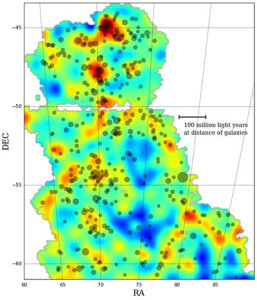 The scientists have imaged the sky for two five-night stretches every year since November 2012. Every night, the DECam’s sensitive 570-megapixel eye captures images of an area of sky totaling about 200 to 250 times the area of the full moon, returning to each field of view three times. Sheppard and Trujillo run the images from each night through software that tags everything that moves. “We have to verify everything by eye,” Sheppard says. So they look through about 60 images a night, or 300 total from a perfect five-night observing run, a process that gives them a few dozen objects to study at Carnegie’s Magellan Telescope. The scientists want to find worlds beyond Pluto and its brethren—a region called the Kuiper Belt, which lies some 30 to 50 astronomical units from the sun (compared to the Earth’s 1). On their first observing run, they caught one. This new world, with the catalog name of 2012 VP113, comes as close as 80 astronomical units from the sun and journeys as far as 450. Along with Sedna, a minor planet discovered a decade ago, it is one of just two objects found in what was once thought of as a complete no man’s land. Sheppard and Trujillo also have discovered another dwarf planet that is one of the top 10 brightest objects beyond Neptune, a new comet, and an asteroid that occasionally sprouts an unexpected tail of dust. Northern Arizona University’s David Trilling and colleagues used the DECam for three nights in 2014 to look for “centaurs”—so called because they have characteristics of both asteroids and comets. Astronomers believe centaurs could be lost Kuiper Belt objects that now lie between Jupiter and Neptune. Trilling’s team expects to find about 50 centaurs in a wide range of sizes. Because centaurs are nearer to the sun than Kuiper Belt objects, they are brighter and thus easier to observe. The scientists hope to learn more about the size distribution of Kuiper Belt objects by studying the sizes of centaurs. The group recently completed its observations and plan to report them later in 2015. Lori Allen of the National Optical Astronomy Observatory outside Tucson, Arizona, and her colleagues are looking for objects closer than 1.3 astronomical units from the sun. These near-Earth objects have orbits that can cross Earth’s—creating the potential for collision. Allen’s team specializes in some of the least-studied NEOs: ones smaller than 50 meters across. Even small NEOs can be destructive, as demonstrated by the February 2013 NEO that exploded above Chelyabinsk, Russia. The space rock was just 20 meters wide, but the shockwave from its blast shattered windows, which caused injuries to more than 1000 people. In 2014, Allen’s team used the DECam for 10 nights. They have 20 more nights to use in 2015 and 2016. They have yet to release specific findings from the survey’s first year, but the researchers say they have a handle of the distribution of NEOs down to just 10 meters wide. They also expect to discover about 100 NEOs the size of the one that exploded above Chelyabinsk. Most surveys looking for “space junk”—inactive satellites, parts of spacecraft and the like in orbit around the Earth—can see only pieces larger than about 20 centimeters. But there’s a lot more material out there. How much is a question Patrick Seitzer of the University of Michigan and colleagues hope to answer. They used DECam to hunt for debris smaller than 10 centimeters, or the size of a smartphone, in geosynchronous orbit. The astronomers need to capture at least four images of each piece of debris to determine its position, motion and brightness. This can tell them about the risk from small debris to satellites in geosynchronous orbit. Their results are scheduled for release in mid-2015. This Fermilab press release came out on Aug. 18, 2014. On Aug. 15, with its successful first season behind it, the Dark Energy Survey (DES) collaboration began its second year of mapping the southern sky in unprecedented detail. Using the Dark Energy Camera, a 570-megapixel imaging device built by the collaboration and mounted on the Victor M. Blanco Telescope in Chile, the survey’s five-year mission is to unravel the fundamental mystery of dark energy and its impact on our universe. Along the way, the survey will take some of the most breathtaking pictures of the cosmos ever captured. The survey team has announced two ways the public can see the images from the first year. 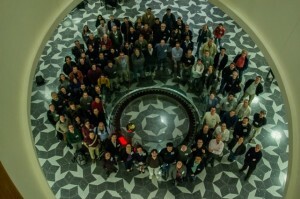 Today, the Dark Energy Survey relaunched Dark Energy Detectives, its successful photo blog. Once every two weeks during the survey’s second season, a new image or video will be posted to www.darkenergydetectives.org, with an explanation provided by a scientist. During its first year, Dark Energy Detectives drew thousands of readers and followers, including more than 46,000 followers on its Tumblr site. Starting on Sept. 1, the one-year anniversary of the start of the survey, the data collected by DES in its first season will become freely available to researchers worldwide. The data will be hosted by the National Optical Astronomy Observatory. The Blanco Telescope is hosted at the National Science Foundation’s Cerro Tololo Inter-American Observatory, the southern branch of NOAO. 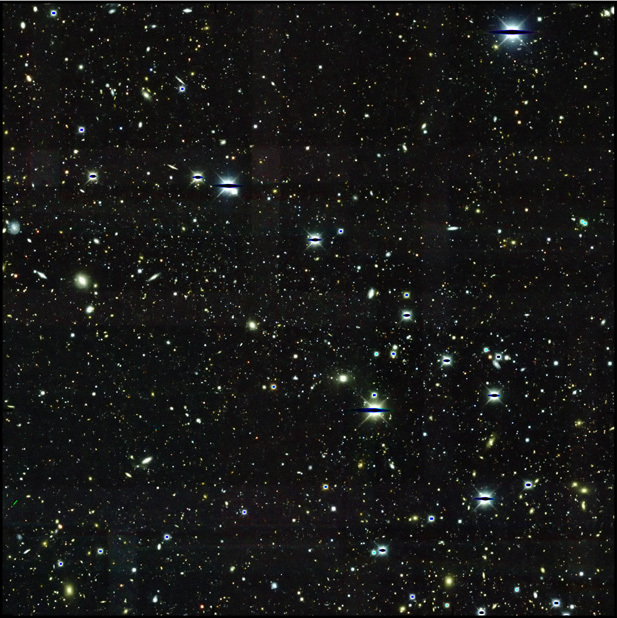 In addition, the hundreds of thousands of individual images of the sky taken during the first season are being analyzed by thousands of computers at the National Center for Supercomputing Applications at the University of Illinois at Urbana-Champaign, Fermi National Accelerator Laboratory (Fermilab), and Lawrence Berkeley National Laboratory. The processed data will also be released in coming months. Scientists on the survey will use these images to unravel the secrets of dark energy, the mysterious substance that makes up 70 percent of the mass and energy of the universe. Scientists have theorized that dark energy works in opposition to gravity and is responsible for the accelerating expansion of the universe. While results on the survey’s probe of dark energy are still more than a year away, a number of scientific results have already been published based on data collected with the Dark Energy Camera. The first scientific paper based on Dark Energy Survey data was published in May by a team led by Ohio State University’s Peter Melchior. Using data that the survey team acquired while putting the Dark Energy Camera through its paces, they used a technique called gravitational lensing to determine the masses of clusters of galaxies. In June, Dark Energy Survey researchers from the University of Portsmouth and their colleagues discovered a rare superluminous supernova in a galaxy 7.8 billion light years away. A group of students from the University of Michigan discovered five new objects in the Kuiper Belt, a region in the outer reaches of our solar system, including one that takes over a thousand years to orbit the Sun. In February, Dark Energy Survey scientists used the camera to track a potentially hazardous asteroid that approached Earth. The data was used to show that the newly discovered Apollo-class asteroid 2014 BE63 would pose no risk. Several more results are expected in the coming months, said Gary Bernstein of the University of Pennsylvania, project scientist for the Dark Energy Survey. The Dark Energy Camera was built and tested at Fermilab. The camera can see light from more than 100,000 galaxies up to 8 billion light-years away in each crystal-clear digital snapshot. The Dark Energy Survey Collaboration comprises more than 300 researchers from 25 institutions in six countries. For more information, visit http://www.darkenergysurvey.org. The National Optical Astronomy Observatory (NOAO) is operated by the Association of Universities for Research in Astronomy (AURA), Inc., under cooperative agreement with the National Science Foundation. This article appeared in Fermilab Today on June 27, 2014. The first images taken by the Dark Energy Survey after it began in August 2013 have revealed a rare, “superluminous” supernova (SLSN) that erupted in a galaxy 7.8 billion light-years away. The stellar explosion, called DES13S2cmm, easily outshines most galaxies in the universe and could still be seen in the data six months later, at the end of the first of what will be five years of observing by DES. Supernovae are very bright, shining anywhere from 100 million to a few billion times brighter than the sun for weeks on end. Thousands of these brilliant stellar deaths have been discovered over the last two decades, and the word “supernova” itself was coined 80 years ago. Type Ia supernovae, the most well-known class of supernovae, are used by cosmologists to measure the expansion rate of the universe. But SLSNe are a recent discovery, recognized as a distinct class of objects only in the past five years. Although they are 10 to 50 times brighter at their peak than type Ia supernovae, fewer than 50 have ever been found. Their rareness means each new discovery brings the potential for greater understanding — or more surprises. It turns out that even within this select group of SLSNe, DES13S2cmm is unusual. The rate at which it is fading away over time is much slower than for most other SLSNe that have been observed to date. This change in brightness over time, or light curve, gives information on the mechanisms that caused the explosion and the composition of the material ejected. DES can constrain the potential energy source for DES13S2cmm thanks to the exceptional photometric data quality available. Only about 10 SLSNe are known that have been similarly well-studied. Although they are believed to come from the death of massive stars, the explosive origin of SLSNe remains a mystery. The DES team tried to explain the luminosity of DES13S2cmm as a result of the decay of the radioactive isotope nickel-56, known to power normal supernovae. They found that, to match the peak brightness, the explosion would need to produce more than three times the mass of our sun of the element. However, the model is then unable to reproduce the rate at which DES13S2cmm brightened and faded. A model that is more highly favored in the literature for SLSNe involves a magnetar: a neutron star that rotates once every millisecond and generates extreme magnetic fields. Produced as the remnant of a massive supernova, the magnetar begins to “spin down” and inject energy into the supernova, making the supernova exceptionally bright. This model is better able to produce the behavior of DES13S2cmm, although neither scenario could be called a good fit to the data. DES13S2cmm was the only confirmed SLSN from the first season of DES, but several other promising candidates were found that could not be confirmed at the time. More are expected in the coming seasons. The goal is to discover and monitor enough of these rare objects to enable them to be understood as a population. Although designed for studying the evolution of the universe, DES will be a powerful probe for understanding superluminous supernovae. This article appeared in symmetry on May 1, 2014. Physicists working on the Dark Energy Survey can expect to pull many an all-nighter. The international collaboration of more than 120 scientists aims to take about 100,000 photographs peering deep into the night sky. Scientists must personally review many of these photos to make sure the experiment is working well, and they’ve come up with ways to stay motivated while doing so. DES scientists collected almost 14,000 photographs from August 2013 to February 2014, in the first of five seasons they plan to operate their sophisticated Dark Energy Camera. Even for those of us who aren’t trying to take the most detailed survey of the universe, it might not come as a surprise that complications can occur during operation. For example, the telescope may not always sync up with the natural movement of the night sky, and passing airplanes can create trails in the images. Software bugs can also cause issues. Two of the DES researchers, Erin Sheldon of Brookhaven National Laboratory and Peter Melchior of The Ohio State University, created the DES Exposure Checker, an online gallery of images from the telescope. Team members use the photo repository as a way to spot imperfections and other issues with the images so they can fix problems as quickly as possible. When reviewing photos, DES scientists flag the ones that show symptoms of different problems, such as long streaks from satellites; unwanted reflections, called ghosts; or marks left by cosmic rays. But the process can get overwhelming with thousands of photos to look over. 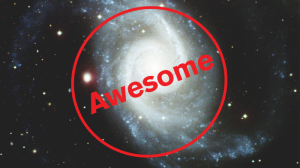 So the DES researchers decided to add a positive classification to the mix—an “Awesome!” category. When someone sees an incredible photo, they can mark it as such in the database. Sheldon points out one of his favorite images, one that captured a passing comet. “It was just so serendipitous. We couldn’t find that if we pointed the telescope in the same place at any other time,” he says. Steve Kent, Fermilab scientist and head of the experimental astrophysics group, says one of his favorite images from the survey shows a dying star. In the color photo, a bright blue oxygen haze surrounds the hot remnant of what was formerly a giant red star. A second way to encourage team members classifying images is the leader board posted on the DES Exposure Checker website, honoring individuals who have categorized the most photos. Researchers compete to see their names at the top. But more than friendly competition drives the DES team to categorize images. They’re also seeking answers to questions about the past and future of our universe such as: Has the density of dark energy changed over time? Why is the expansion of the universe speeding up? This article appeared in symmetry on Sept. 3, 2013. Space: the final frontier. These are the voyages of the Dark Energy Survey. Its five-year mission: to map a portion of the southern sky in unprecedented detail. To use the world’s most powerful digital camera to probe the mystery of dark energy. To boldly photograph where no astrophysicist has photographed before. The Dark Energy Survey officially began on Saturday, Aug. 31. Using the Dark Energy Camera, a 570-megapixel imaging device built at Fermilab, scientists plan to take clear, dazzling pictures of the largest number of galaxies ever studied in such a survey. The camera is mounted on a telescope at the Cerro Tololo Inter-American Observatory in Chile, which offers a mountaintop vista perfect for obtaining crystal-clear, high-resolution images. Over five years, scientists will capture full-color photographs of 300 million galaxies, 100,000 galaxy clusters and 4000 new supernovae. The camera is powerful enough to see light from more than 8 billion light years away. The Dark Energy Camera’s 62 charged coupled devices will provide a previously unheard-of level of sensitivity to red light. This will help determine the distances to galaxies—those that appear red are generally farther away, while those that appear blue are nearer by. 1. 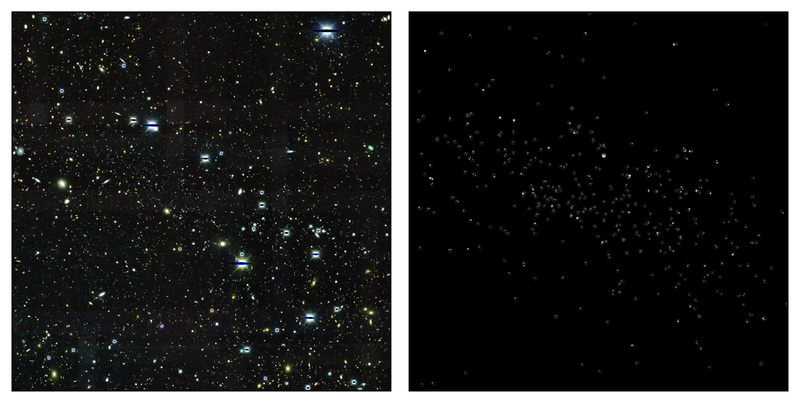 Counting galaxy clusters. While gravity pulls mass together to form galaxies and clusters of galaxies, dark energy pushes it apart. The Dark Energy Camera will see light from galaxy clusters billions of light years away, and counting those clusters at different points in time will offer insight into the cosmic competition between gravity and dark energy. 2. Measuring supernovae. A supernova is a star that explodes, becoming as bright as an entire galaxy of billions of stars. By measuring how bright it appears on Earth, scientists can tell how far away a supernova is and then use that information to determine how fast the universe has been expanding since the star’s explosion. 3. Studying the bending of light. When light from distant galaxies encounters dark matter in space, it bends around it, causing those galaxies to appear distorted in telescope images. The survey will measure the shapes of 200 million galaxies, exploring how gravity and dark energy mold the lumps of dark matter throughout space. 4. Using sound waves to map the universe’s expansion. Sound waves created hundreds of thousands of years after the big bang left an imprint on the way galaxies are distributed across the universe. The survey will measure the positions in space of 300 million galaxies to find this imprint and use it to infer the history of cosmic expansion. The Dark Energy Camera achieved first light in September of last year. During the subsequent commissioning phase, the camera was put through its paces. Along the way, it captured dozens of sharp, clear images. You can see some of them at the survey’s official photo blog, Dark Energy Detectives, and even more in an interactive mosaic of 62 DECam images. With the survey now officially underway, scientists will collect data between September and February each year through 2018. This “season” was chosen because the portion of the sky scientists wish to observe will be overhead during those months, and the weather in Chile will be the most cooperative. This article originally appeared in Fermilab Today on April 26, 2013. Images from the Dark Energy Camera before (left) and after (right) a supernova explosion in a galaxy about 2 billion light-years away. The Dark Energy Survey (DES) collaboration has captured images of 176 star explosions, called supernovae, including 16 that occurred farther than 7 billion light-years away and when the universe was only about half as old as it is today. A new type of CCD detector contained in the Dark Energy Camera enabled identification of the distant supernovae, making DECam about 10 times more sensitive than other optical cameras to the long-wavelength (red and near-infrared) light coming from these very distant explosions. This improved sensitivity will allow the DES collaboration to find more supernovae from this period in the history of the universe than any other project. Our current understanding is that the universe is made up of about 70 percent dark energy and that this dark energy is causing the universe to expand at an accelerating rate. Measuring Type 1a supernovae is a way to study dark energy. The fainter the observed explosion, the further away it is, similar to the difference in brightness between nearby and distant candles. As the light of the explosion travels to us, it is stretched by the expansion of the universe and becomes redder. By combining the measured brightness and information about how much the light is stretched, cosmologists can calculate the expansion rate of the universe. The Dark Energy Survey collaboration includes scientists, postdocs and graduate students from around the world, who worked together to build the camera, collect the images and identify the supernovae described in this result. The amount and wavelength of a supernova’s light determines its age and type. Researchers use filters that divide optical light into four separate parts, with each filter allowing only certain wavelengths to pass through. We know these 16 supernovae are about 7 billion light-years away because most of the light was observed with the filter that allowed only the reddest light to pass through and be measured by the special red-sensitive detectors in the camera. Less sensitive cameras require time-consuming follow-up observations to determine the supernova age. To search for supernovae, the DES observers take images of the same patch of sky every four to seven days. Then they subtract the images from each other and search for differences. Computers and teams of people looked at thousands of sets of DECam images to find the 176 candidate supernovae. So far five of the candidates have been followed up, and all five were confirmed to be type 1a supernovae. The Dark Energy Survey will measure more than 3,000 type-1a supernovae in the next five years and provide new information about the mysterious nature of dark energy. For more information, see the Dark Energy Survey website.